Texas International Airlines was born out of two companies; Aviation Enterprises from 1944 until 1947 and from 1969 as Trans-Texas Airways. The company was based near William P. Hobby Airport in Houston, Texas. The company provided regional passenger service in Texas and surrounding states for most of its life. Texas International was also considered to be the unofficial flag carrier for the state of Texas, today Continental Airlines holds that position During the 1960s the airline operated a Beechcraft Model 99 and six Convair 600s. By the early 1960s, Texas International had service from one side of Texas to the other, going as far west as El Paso and as far east as Texarkana, Arkansas (the airport for the city also serves neighboring Texarkana, Texas). Soon, flights into New Mexico were added. In 1967 it purchased a fleet of McDonnell Douglas DC-9 jets: nineteen of the Series 10 model and seven of the Series 30 aircraft, operating them to airports as small as Baton Rouge, Louisiana, Beaumont, Texas, and Little Rock, Arkansas. The airline was derisively called "Tree Top Airlines" and "Tinker Toy Airlines" by its competitors. When Trans-Texas Airways changed its name to Texas International Airlines, the company ran newspaper ads showing a Tinker Toy airplane flying along treetops. The copy read "No More Tinker Toys. No More Treetops. We are now Texas International Airlines." After consulting to Texas International Airlines (TIA) for several months, Lorenzo acquired control of it in 1972 through Jet Capital, which acquired 26% of TIA's equity interest and 59% of the voting power for $1.15 million. Lorenzo became its president in August 1972. The deal was approved by the Civil Aeronautics Board (CAB), which regulated the airline industry in the United States at the time. When Lorenzo took control of TIA in 1972, it was on the verge of financial collapse, having lost money since 1966 including roughly $7 million annually for the previous three years. Lorenzo and his management team "acutely [understood] the risks in...redirecting a highly regulated company with serious operating problems. " Two years later, Lorenzo's management was able to steer the company to break even due to significant streamlining of operations. Some years later an analyst from Oppenheimer & Company, citing Lorenzo and business-partner Carney’s strategies of substituting obsolete planes with jets, eliminating unprofitable routes in exchange for destinations with higher demand, and instituting half-price “peanut-fares” for the first time in the aviation industry, noted TIA’s ability to compete and win against much larger and financially stronger companies. In the succeeding five years, Lorenzo's management changed the character of the airline, having revamped the fleet, increased utilization, cut costs and dropped a lot of losing routes and added flights on strong segments. The average trip distance per passenger boarded jumped 25% from 1972 to 1976. In 1977, the company earned $8 million, and in 1978, TIA's reported net income was up to $13.2 million and it was described as an "aggressive, innovative carrier". From 1972 to 1978, Lorenzo and his management team turned a $6.3 million loss on $63 million in revenue into a $13.2 million profit on $158 million in revenue. Historically, the airline had scheduled service to such cities as: El Paso, McAllen, Amarillo, Lubbock, Wichita Falls, San Angelo, Abilene, Midland-Odessa, Austin and Beaumont-Port Arthur. Outside of Texas, service included Arkansas (Hot Springs), New Mexico (Roswell, Albuquerque, Hobbs and Santa Fe), Colorado (Denver), California (Los Angeles), Nevada (Las Vegas), and Mexico (Veracruz and Tampico). During the mid-1970s, in response to intense competition from Southwest Airlines, Texas International successfully petitioned the Civil Aeronautics Board to begin offering discounted fares on its awarded routes. These fares become a staple of the airline known as "Peanuts Fares". Following the 1978 Airline Deregulation Act the airline expanded its routes throughout much of the central and southern United States. On June 11, 1980, Lorenzo established a holding company, Texas Air Corporation, for Texas International. Texas Air bought Continental Airlines in 1982, then merged Texas International with Continental. 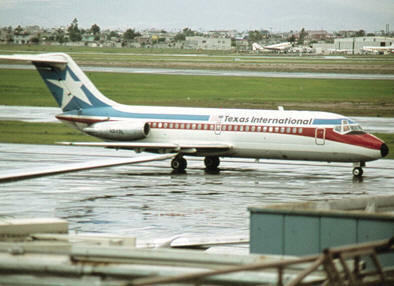 The last Texas International aircraft were seen in 1983. Texas International is noteworthy as being the sole carrier to bring jet service to the airports in Abilene, Hot Springs, Wichita Falls, San Angelo, Roswell, Hobbs and Texarkana. Even 30 years later, none of these airports saw "full size" jet service again.